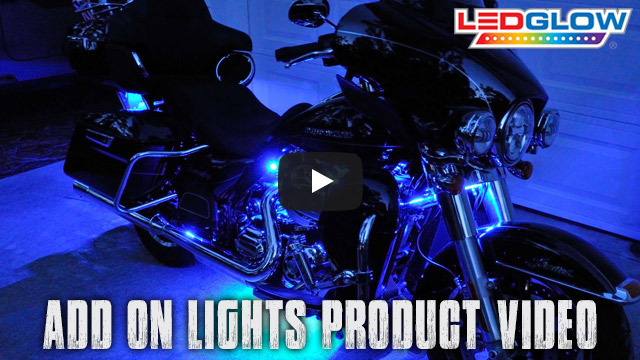 LEDGlow’s 2pc Advanced Single Color Motorcycle Lighting Add-On Kit allows you to easily add additional single color motorcycle lighting strips to your existing Advanced Single Color Motorcycle Lighting Kit. LEDGlow’s 2pc Advanced Single Color LED Flexible Motorcycle Add-On Strips allows you add additional SMD motorcycle lighting strips to your existing Advanced Single Color Motorcycle Lighting Kit. These add on kits are available in 5", 7", 9" and 11" strip options; all available in color options including Blue, Red, Green, White, Orange, Pink, Purple and Yellow. Every motorcycle led lights add on kit includes a 2pc power harness for an easy installation. LEDGlow's LED lights for motorcycles include a one year limited warranty and free lifetime technical support. After purchasing a 10 light kit, I wanted more lights so I was able to add two extra lighting runs after replacing a plug-in on my 10 light kit. The remotes are great. The lights really make me visible at night! I highly recommend these to all who want to dress up their bike and make it look personalized. Wire clips was not connected to the wire. Was not attached to the wire.